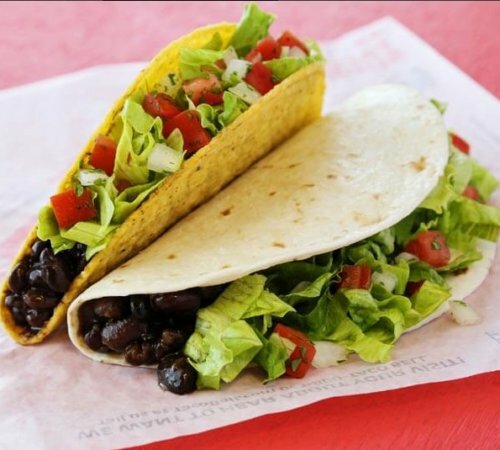 Ordering vegan at Taco Bell has always been one of the easiest options when it comes to fast food chains. Their menu has excellent alternatives, much in keeping with Mexican food in general. Black beans, salads, salsa, jalapenos, rice… you didn’t have to look far for something to substitute in your tacos and burritos. Then Taco Bell launched their Vegan Menu and we finally had certified vegan options and now know what is officially vegan on the menu. It was also a good sign of fast food chains paying attention to their vegan customers! There were, however, a couple of mistakes made along the way with the menu. The taco bell rice ingredients, for example, were originally cooked with traces of butter, which was fine for the original Vegetarian Menu but not for vegans. But that was solved in June 2017 however and we now have seasoned rice – thankfully – back on the menu. 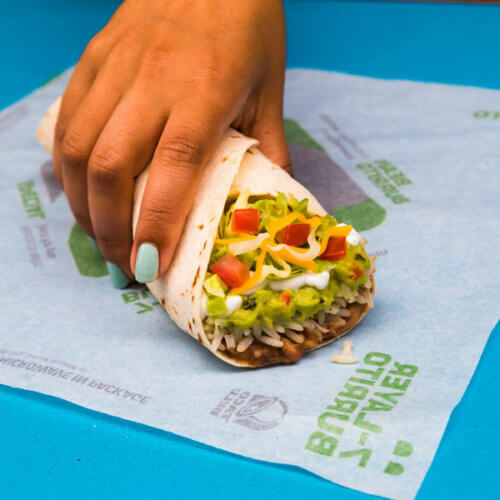 Ever since the Vegan Taco Bell Menu was launched we’ve been waiting to see dedicated Vegan menus spread across other fast food chains. It’s slow, but I’m sure it’s coming! For now though, vegans looking for their fast food fix at Taco Bell can be more than satisfied with ordering any of the items below. It’s just a matter of knowing what individual ingredients are vegan and substituting that ingredient in the menu item. As always, because it is vegan doesn’t mean it’s necessarily healthy – it’s good to be up to date on what processed sugars and starches are used in your food. But at least it means that you have vegan options at when you need something convenient, quick and filling, which is what fast food is supposed to be when it’s necessary! Yes, you can enjoy that loud ‘crunch-ability’ vegan style! Remove the sour cream, nacho cheese and beef and replace with black beans. Asking for ‘al fresco’ will substitute the cream cheese with pico de gallo and you’re set! 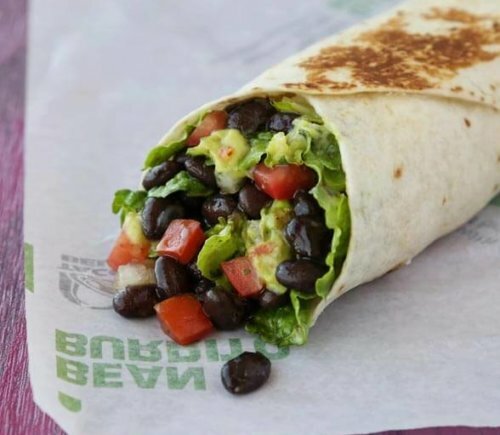 The staple of any Taco Bell, the bean burrito had always been the perfect vegan go-to before Taco Bell ever thought to create a vegan menu. They key here is to remove the sour cream and add the toppings below depending on how big and spicy you want it. Just beware that the fire sauce packet is not vegan and nor is the avocado ranch dressing. Now that seasoned rice is back and certified vegan – hallelujah! – there is no holding back on the seven layer burrito! All layers can be vegan while of course holding off on the sour cream. Perfect with salsa and guacamole used as a replacement for the cheese and chipotle. Gordita flatbreads, the soft and hard taco shells, and the tosada shells are all certified vegan, however just remember that the salad taco shells are not. With vegan shells, you can throw whatever you like from the options below for your custom made taco. Just remove the beef and replace with black beans and guacamole with all the trimmings. 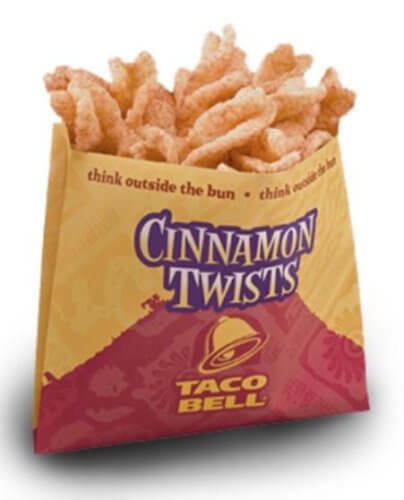 And finally, one item which is not on the Taco Bell Vegan menu but is vegan: the Cinnamon Twists! Why they didn’t include this on the menu, who knows, but it certainly is vegan, and perfect if you have a sweet tooth. It is also perfect for a vegan breakfast at Taco Bell. There you have some pretty appetizing options from Taco Bell that any vegan can enjoy. And it’s weird because I don’t think I have ever met a vegan that didn’t like Mexican food. Maybe that’s just a vegan thing? 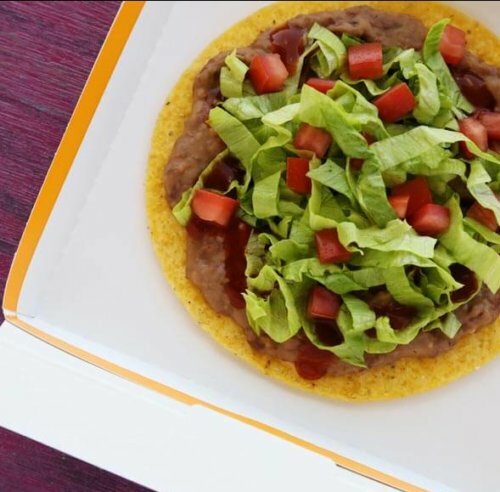 If only it was as easy finding vegan options at McDonalds or vegan options at KFC, but at least Taco Bell is leading the way! If you have any vegan tricks or tips for Taco Bell we would love to hear about them. Please comment and let us know or just send us message. We may update this article to include them so you’d be helping vegans everywhere with your advice! Thanks for giving us vegans some options if we are ever in a bind & need something to eat. You never know when this information will be valuable. Karen Yuen there’s such thing? If it’s a choice between being starving on a road trip and hitting this drive thru, I’d pick Taco Bell. And the article is annoying but first world problems, ya know? ! Are you sure the beans contain no lard? This is good to know. 🙂 Local favorite, Mighty Taco, literally labels one of their burritos vegan. This is a nice change from the plain old bean burrito that I used to be stuck with as an option. A lot of negative people here! The choices, especially the fresco one, actually sound really good! Would be great if you could please thank the people who took the time to write this article instead of blaming them. You can always ignore this post. I don’t eat too much fast food. I love to cook my food fresh from scratch but sometimes if you’re in a rush or on the road, this info could save you time. Yeah you can always go to store and get a banana if you want, but not all people think the same… smh!! Um except it’s still Taco Bell. Gross. When I first became Lactose intolerant I thought I wouldn’t be able to eat Taco Bell again. I was looking at the menu online when I discovered their secret Vegan menu. Essentially just order everything Fresco. Of course there are better options out there but there have been many times Taco Bell has saved this vegan family after a day of swimming, hiking or going to the beach. Especially if you have very little money on hand. And when you are on the road, with vegan kids, you appreciate any options when you don’t have a kitchen or just don’t want to prepare something (even Super Vegan Mom gets tired). I live in southern California so I have a lot of choices but there have been times when Taco Bell has been the ONLY food we have found in a pinch. Gross. Why would you want to?? Even when I order vegan, I still get a stomach ache. 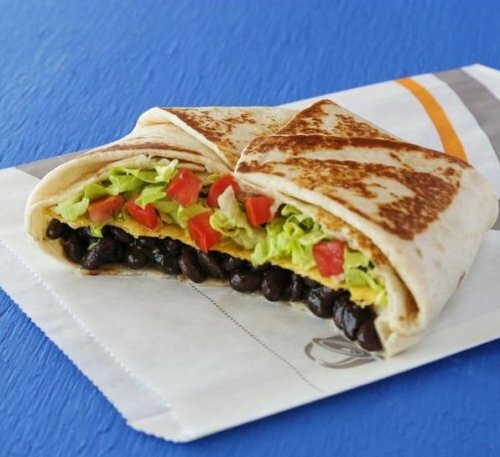 Why in the world would you go vegan and eat at Taco Bell…? Thank you for this! Not vegan here, but my daughter has egg and milk allergies. I just looked up their allergen menu, and it’s one of the best I’ve seen, especially for fast food. Even buns aren’t always milk free most places. Who would want to eat there at all? Kaytee Ryan maybe we can eat there?? The potatoes can be added to anything too. And the cinnamon twists are vegan. Not good enough Taco Bell you still have gmos in your food. bean hard shell tacos minus cheese loaded with lettuce toms etc and salsa are dang good! TY for this post! If I still have to work at a fast food place this will be where I go. I hate working at McDonald’s. Some of you guys Crack me up. Not every vegan is into clean eating or healthy stuff. Some people just want to save the animals. Who cares how vegan someone else is as long as everyone supports it? If you were the only vegan person in the family and they loved going to Taco Bell, then at least you could eat with the family and not seem stuck up to them. That’s been my experience at times! I love their bean and black bean burritos. What i really wish they still had was a short lived veggie fajita they sold in the mid-90s. It was the tastiest item they’ve ever sold. So tortilla is made with? yes all thats true unhealthy and such but I doubt there are people out there who aren’t aware that they don’t prepare vegan options with the care that we use in our own kitchen ,it is nice to have an option if we should go there. Taco TIME. Never go to Taco Bell. Taco Time. Veggie soft taco with black beans, hold the cow. Now we’re talking! And all their corn and oils are no doubt GMO based. Yea, I would still rather focus on healthy vegan options. The integrity of this company’s products still don’t fit a ‘wellness’ standard, or compassion towards our own body. To come across organic fruits and veggies that are cheap isn’t very difficult. Also, we must go back to preparing our food if we want it’s purpose to nourish us (on all levels) to be effective. Gotta promote other things than taco bell. This company is still not ethical and moral in their business, and yea, round up central. That’s still a very big deal. I’m not strictly vegan, I do cheese sometimes, but their cheese is blah so I always order my bean burrito with no cheese and extra onions instead. You can’t mess up beans and onions! YUM !!! the same grill used for other items? The same fry baskets used for other items? Don’t the refried beans have lard in them….an example, chipotle switched to a vegetarian prep for the pinto beans which previously were made with pork. Also make sure when buying them in a can to get the fat free/vegetarian version, otherwise they will contain lard. Just read an article that it’s really not so healthy at Taco Bell for anyone. Not sure about the refried beans being vegan (animal lard)? That’s why I always ask for black beans with their Tacos. People who are just starting out vegan could get the wrong impression of what veganism is by all the negativity in comments to articles like these. GMOs, company ethics, hands and surfaces that touch meat, non-organic, etc. etc. These are viable topics, but I know lots of people, who might be open to the idea from an ethics point of view, that already think veganism is too hard and complicated to attempt. Articles like these help people who aren’t going to the farmer’s market and making everything from scratch and reading up an all the super healthy and environmental topics, to just find something to eat! As a relatively new vegan, I get put off by such high-and-mighty purity. So thank you to the authors of this article! Some of us appreciate it. been eating vegan at taco bell (when neccesary) for years! Yes, and it is nice to have the option when traveling with the grandkids!